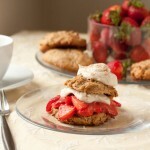 A cinnamon biscuit filled with naturally sweetened strawberries, and topped with vegan whipped cream. 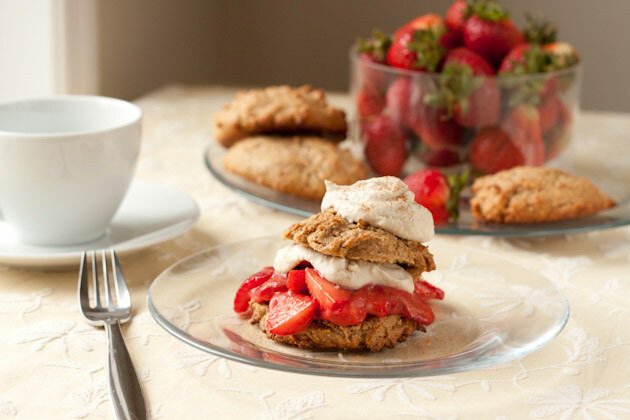 This grain-free and healthful approach to the classic strawberry shortcake dessert is sure to please the family. For the strawberry filling: Heat strawberry puree, lemon juice, vanilla, and stevia in a small saucepan over medium heat until boiled. Remove from heat, whisk in arrowroot starch, then sliced strawberries. Set aside. Preheat oven to 350F and line a cookie sheet with parchment paper or a silicon baking mat. Set aside. Combine water + flax seed in a small bowl and set aside. In a large bowl, combine the almond flour, cinnamon, baking powder, and salt. In a small bowl, blend earth balance, sugar, milk, and egg. Stir the wet ingredients into the dry mixture until thorough combined. Drop the batter 1/4 cup at a time onto the prepared baking sheet making sure there is at least 1.5” between each biscuit. Bake for 15-20 minutes [mine took 16 minutes], until golden on the tops, or until toothpick inserted comes out clean. Once complete, all to cool on a wire rack at room temperature. Pierce the bottom of the chilled can of coconut milk to drain out the liquid portion of milk. Then, open the top of the can and drop the solid milk and vanilla extract into the chilled glass bowl. Beat with hand mixer for 15 seconds before adding powdered coconut sugar and blending for another 15 seconds. Place back in fridge until ready to use. Slice biscuits in half crosswise. Divide the strawberries evenly over the 4 biscuit bottoms. Top each with 1 tablespoon of the whipped cream, cap with biscuit tops and finish with a dollop of whipped cream. Sprinkle with cinnamon and serve!